Last night I watched Bizarre Foods with Andrew Zimmer on the travel channel. This is a good show, for the most part. I watch it every week. This episode found him along the Gulf Coast. It was a little more exciting for me than other episodes, because I have a better chance of traveling to these destinations. I doubt I'll ever make it to the Philippines or India (although I would really really love to). But Southern U.S.? I might be able to swing that. 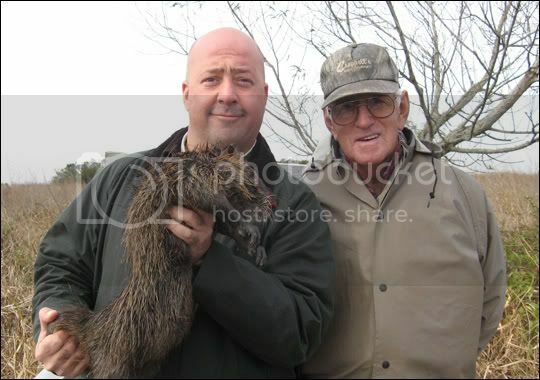 What you see in the picture above is Andrew and a hunter with a Nutria. It's a kind of water rodent. Coincidentally, CHOW just had a little blurb about a very similar looking creature called the Capybara that is commonly eaten in South America. I thought the Nutria and Capybara might be related...they look alike and all, but they are from different animal families. Anyway, the Nutria sounded pretty tasty...I think Andrew described it as if a chicken and a rabbit mated, that's what the offspring might taste like. Here's some Nutria recipes. In Mississippi, Andrew went to a down-home soul food/BBQ place called Leatha's. He was there with a member of some Southern Food preservation Society...I think it was the Southern Foodways Alliance? Maybe? Anyway, at Leatha's they cooked up some Raccoon and Possum for them...Andre ate it and liked it. He said the Raccoon tasted a lot like dark meat turkey, and wasn't nearly as oily or gamey as he thought it was going to be. The Food society guy was like, "I'll take your word for it." Huh? A guy who's trying to promote traditional southern cooking, and he won't even try the possum and raccoon? That bothered me. Some other things he tried on his trip that are on my list of foods to eat before I die: Alligator, Chitlins, squirrel (the Nutria hunter snuck it into his Nutria stew as a surprise) and turducken. I'm gonna have to try and catch this episode again, because I channel surf too much, and do dishes and such during commercials, so I missed some parts. I saw him eat the Mullet roe though. Deep fried mullet roe. Apparently it's an acquired taste. eek.